“[Ity] Sary nataon'ny tena miaraka amin'ny tarehy efa vita amin'ny atsasany ity, ary ny atsasany tapaka, mampiseho hozatra, hozatry ny vodi-tongotra, ary hoza-madinika. Fandalinana anatomika izany, izay midika fa tsy hita maso ny tena zava-dehibe. Ny Eoropeana, ny Afrikana ary ny Aziatika dia mitovy amin'izany izay lasa fitaovana politika: ny lokon'ny hoditra. Ambonin'izany rehetra izany, olombelona isika, mitovy firazanana, taranak'olombelona.” Sary ôrizinaly avy amin'i Carmen Bolena, navoakan'ny Afroféminas ary nahazoana alalana. 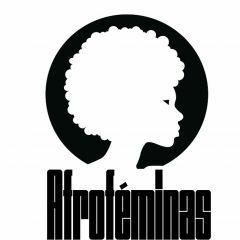 Lahatsoratra avy amin'ilay mpanao gazety Lucia Mbomio ity izay navoaka voalohany tao amin'ny Afrofeminas ary naverin'ny Global Voices navoaka indray rehefa nahazoana alalana. Teratany Ginea Ekoatorialy i Carmen Mbasogo Ezuku. Vao 22 taona izy dia efa nanana talenta mahafinaritra eo amin'ny lafiny maro. Mpianatra zavakanto, mpilalao sarimihetsika, mpihira ary mpandihy izy. Eny, betsaka izany, saingy amin'izao fotoana izao dia hiresaka momba ny sarisary ataony isika. Noho ny asany, nahita vehivavy niresaka tamiko aho, izay nijery ahy teo amin'ny maso, toran'ny hehy ary nanohina ahy noho ny fifaliana sy ny herin'izy ireo. Nahita fanambarana, lalana, sy ny maha-izy ihany koa aho. Amin'i Carmen Bolena, izay anarany eny an-tsehatra, somary mitovy ny zavatra niainany. Lucia Mbomio (LB): Ampy ve ny talenta sa ilaina ny manatsara azy any am-pianarana? Carmen Bolena (CB): I don’t think being born with talent is enough to be really good at any discipline. Nor do I believe that schools have “the manual” to bring out talent from within. What I do know works is the effort, the hours you dedicate to it, and the interest you have to be outstanding in your craft. Carmen Bolena (CB): Heveriko fa tsy ampy ny teraka miaraka amin'ny talenta mba ho tsara kokoa amin'ny fepetra rehetra. Tsy mino koa aho fa manana “boky” hamoahana ny talenta avy ao anaty ny sekoly. Ny zavatra fantatro fa mety dia ny ezaka, ny ora foinao ho azy sy ny fahalianana tsy maintsy hajainao amin'ny asanao. LB: Hitako ny sasany tamin'ireo kisarisary nataonao izay mitovy amin'ny sary, maneho ny tena izy, ary milaza ny antsipiariny…ary ny hafa izay nesorinao ny fanehoana mahazatra mba hampita hevitra. Ohatra, mieritreritra ny sary iray aho, izay ara-dalàna ny atsasaky ny tarehy ary ny atsasany hafa dia nofo izay hananan'ny olombelona rehetra ao anatin'ny hoditra. Tokony ho tsara mihoatra ny hatsarana ve ny zavakanto? Tokony ho foto-kevitra , mpitondra fiovana koa ve izany? CB: Gosh, this question shakes me to my core, hahaha. Let’s see, people love to ask those of us who have studied art (I have reservations about saying “artists”) what art is. Art itself is an abstract concept rather difficult to define because it is ever-changing. Its definition mutates and is linked to its given era. So, to the question “should art be more than beauty, ideological, transformative?” I will respond from a position of absolute subjectivity: It may be, but not necessarily. I am of those who think that art can make you feel without forcing you to think, but never leaves you indifferent. To me, art is a feeling and metamorphic beauty, because just as I see beauty in [Vermeer's] “Girl with a Pearl Earring” or in [Van Gogh's] “Starry Night over the Rhône,” I see beauty in Goya’s “Saturn Devouring His Son” and in the works of Mark Ryden, Michael Hussar or Edward Gorey. 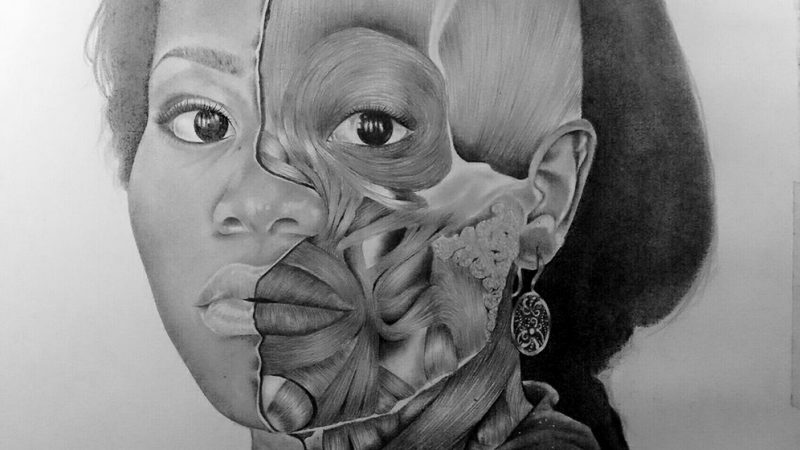 But, specifically, the drawing you mention does make an ideological statement: It is a self-portrait with a half-finished face, and the other half is sliced, showing the muscles, tendons and mucous membranes. It’s an anatomical analysis, which means that what is essential is not visible to the eye. Europeans, Africans and Asians are all equal under that which is so politicized – skin color. Above all, we are people, members of the same race, the human race. CB: Mampangovitra ahy izany fanontaniana izany, hahaha. Andeha hojerena, tia manontany antsika izay nianatra zavakanto (manana ny fijeriko manokana aho rehefa miteny hoe “mpanakanto”) ny olona hoe: inona izany zavakanto. Ny zavakanto tenany dia hevitra saro-takarina fa tsy hoe sarotra faritana satria miovaova hatrany izy. Miova ny famaritana azy ary mifandray amin'ny vanim-potoana nanaovana azy. Noho izany, ny fanontaniana hoe “tokony ho mihoatra noho ny hatsarana, ny ideolojika, mpitondra fiovana ve ny zavakanto?” Dia hovaliako avy amin'ny fijery manokana tanteraka: Mety ho izany, saingy tsy voatery. Anisan'ireo izay mihevitra aho fa ny zavakanto dia mety hahatonga anao hahatsapa fa tsy manery anao hieritreritra, saingy tsy mamela anao tsy hiraharaha izany. Ho ahy, fahatsapana sy hatsarana miovaova ny zavakanto, satria mahita hatsarana amin'ny Girl with a Pearl Earring” an'i [Vermeer] aho na ny an'i [Van Gogh] “Starry Night over the Rhône”. Mahita hatsarana amin'ny “Saturn Devouring His Son” an'i Goya sy ny asan'i Mark Ryden, Michael Hussar na Edward Gorey aho. Saingy, raha ny marina, ny sary lazainao dia manao fanambarana ideolojika: Sarin'ny tena miaraka amin'ny tarehy mbola tsy vita ny antsasany, ary ny atsasany tapaka, mampiseho hozatra, hozatry ny vodi-tongotra, ary ny hoza-madinika. Fandalinana anatomika izany, izay midika fa ny zavatra tena ilaina dia ny tsy hita amin'ny maso. Ny Eoropeana, ny Afrikana ary ny Aziatika dia mitovy amin'izany izay lasa fitaovana politika: ny lokon'ny hoditra. Ambonin'izany rehetra izany, olombelona isika, mitovy firazanana, taranak'olombelona. LM: Ary amin'ny fomba ahoana no tianao hanovana an'ity fiarahamonina ity? CB: In a lot of ways, too many for a century, which is how long a human life can last. But, mainly, there are two that completely concern me: racism and machismo. I think my work reflects the uneasiness and disagreement I have towards these two ideologies that have done and continue to do so much damage in today’s society. CB: Amin'ny fomba maro, maro loatra ho an'ny taonjato iray, izany hoe maharitra hafiriana ny fiainan'olombelona. Fa, indrindra indrindra, misy zavatra roa izay tena mampiahiahy ahy: ny fanavakavaham-bolonkoditra sy ny fanjakazakan'ny herin-dehilahy. Heveriko fa ny asako dia maneho ny tsy fifankahazoan-kevitra sy ny tsy fitovian-kevitra eo amiko amin'ireo ideoloa anankiroa izay efa natao sy manohy manao fahasimbana be eo amin'ny fiarahamonina amin'izao fotoana izao. LM: Mampiseho vehivavy mainty hoditra ny sarinao. Nahoana no izany? CB: Essentially, because it is a project that talks about the identity, acceptance, recognition and empowerment of an invisible collective: black people, marginalized and invisible. They are the protagonists and that’s why they’re represented. Also, because I am black. And it was time to denounce and talk about our situation in some way. CB: Raha ny marina, dia satria tetikasa iray miresaka momba ny maha-izy azy, ny fanekena, ny fankasitrahana ary fanomezan-kery ho an'ny vondrona tsy hita maso: ny olona mainty hoditra, voahilikilika sy tsy hita maso. Mpandray anjara izy ireo ary izany no antony nanehoana azy ireo tamin'ny sary. Ary koa, satria mainty aho. Ary fotoana izao hilazana sy hiresahana momba ny toe-javatra iainanay. LM: Ahoana ny hevitrao, misy fiantraikany amin'ny fikarohanao ny maha-izy azy ve ny maha zaza natsangana? CB: I was adopted when I was six and I have always known that I had two families who cared about me. And although my Asturian family never wanted to distance me from my biological one, this was something that happened on its own. Growing up in an essentially white environment, I was also raised with European values, which almost consecutively led me to reject everything related to my blackness. I wanted to deny my identity for a long time, but it exuded through my pores, forcing me into submission through my gestures, my physique, when it came to dancing … in so many things that I could not deny. Also, I didn’t have any close role models to admire or imitate. Whenever a black person appeared in a public environment, they were prostitutes, immigrants, servants, murderers or, on the other hand, they were always the first to die in movies. I was always the only black person in everything, including entrance exams, which made me very uneasy because I thought I would always be alone. Where were the Africans who were like me in Spain? Going to study in Madrid and meeting groups like Kwanzza [the afro-descendant student community of the Complutense University of Madrid] and E.F.A.E [A collective devoted to ‘empowering afro-descendant females’ in Spain] was definitely a turning point. I saw that there were many more people like me, I was not alone and that there were many of us! Hahaha. It was fantastic to see that among us there were university students of politics, journalism, philology, art, science …. they spanned, we spanned every field. I began to read and to research, to go to conferences and interact socially and for the first time since I left Africa, I felt like I was part of something I identified with. Except for my status as adopted which, while true, you can count us on one hand. All of this discovery was restorative for my troubled conscience. It no longer hurts to recognize that I am black. I am and I say it bursting with pride. CB: Natsangana aho fony enin-taona ary fantatro hatrany fa manana fianakaviana roa izay nikarakara ahy aho. Ary na dia tsy naniry ny hanalavitra ahy amin'ny biôlôjika aza ny fianakaviako Asturian, zavatra nitranga ho azy izany. Lehibe teo amin'ny tontolo fotsy hoditra, notezaina tamin'ny soatoavina Eoropeana ihany koa aho, izay nitarika ahy handà ny zava-drehetra mifandray amin'ny maha mainty ahy avy eo. Te handà ny maha izaho ahy aho nandritra ny fotoana ela, saingy nampiseho ny mason-koditro, nanery ahy hanaiky amin'ny alalan'ny fihetsiko, ny vatako rehefa mandihy … tamin'ny zavatra maro izay tsy azoko lavina izany. Tsy mba nanana maodely akaiky ankafizina sy nalaina tahaka ihany koa aho. Isaky ny misy olona mainty hoditra mipoitra am-pahibemaso, mpivaro-tena, mpifindra monina, mpanompo, mpamono olona izy ireo, na, etsy ankilany, izy ireo no voalohany maty amin'ny filma. Izaho foana no olona mainty hoditra tamin'ny zava-drehetra, anisan'izany ny fanadinana hidirana hianatra, izay nahatonga ahy hikorontan-tsaina satria nihevitra aho fa ho irery foana. Aiza ireo Afrikana toa ahy tany Espaina? Tena fiovana lehibe ny fandehanana nianatra tany Madrid na ny fihaonana amin'ireo vondrona tahaka ny Kwanzza [vondrom-pirahamonin'ny mpianatra taranaka Afrikanina ao amin'ny Oniversiten'i Complutense ao Madrid] sy ny E.F.A.E [Fikambanana natao “hanomezan-kery ho an'ireo vehivavy Afrikanina’ any Espaina]. Hitako fa maro kokoa ny olona toa ahy, tsy irery aho ary marobe izahay! Hahaha. Mahafinaritra ny mahita fa teo aminay, nisy ireo mpianatry ny oniversite momba ny politika, ny fanaovan-gazety, ny filôzôfia, ny zavakanto, ny siansa….niparitaka izy ireo, niparitaka tamin'ny sehatra maro izahay. Nanomboka namaky boky sy nikaroka aho, nandeha tany amin'ny fihaonambe ary nifandray tamin'ny fiarahamonina ary sambany hatramin'ny nialako an'i Afrika, nahatsapa aho fa anisan'ny ao anatin'ny zavatra iray. Ankoatra ny satako amin'ny maha zaza natsangana, izay raha marina, afaka manantena anay ianao. Famerenana amin'ny laoniny ny feon'ny fieritreretako nikorontana ireo zava-baovao rehetra ireo. Tsy mahatezitra intsony ny mankatoa fa mainty aho. Mainty aho ary lazaiko fa mirehareha amin'izany aho.